Numeric links in the itinerary refer to the map of 59 Division movements shown below. 21 August : 59 Division reconstituted as duplicate of 55 Division; Major General John BLAKISTON-HOUSTON appointed to command. 1 December : New division commander: Major General Thomas Ralph EASTWOOD. Jan-May : 1/6 South Staffords and 1/7 Royal Warwicks attached to BEF in France. Evacuated via Dunkirk. 11 May : Gen. Eastwood transfered to command of 18 Division. New division commander: Major General Frederick Vavasour Broome WITTS. 15 February : New division commander: General Sir James Stuart STEELE. 5 April : Gen. Steel promoted to command of 2 Corps. New division commander: Major General William Pat Arthur BRADSHAW. 31 July : 12 Corps establish under Lieut. Gen. Neil Ritchie and designated as the invasion follow-up corps, comprising 43rd (Wessex), 53rd (Welsh), and 59th (Staffordshire) Divisions. 30 March : Gen. Bradshaw transfered to command of 48 (South Midland) Division. New division commander: Major General Lewis Owen LYNE (ex 169 Brigade — Middle East, North Africa, Italy). 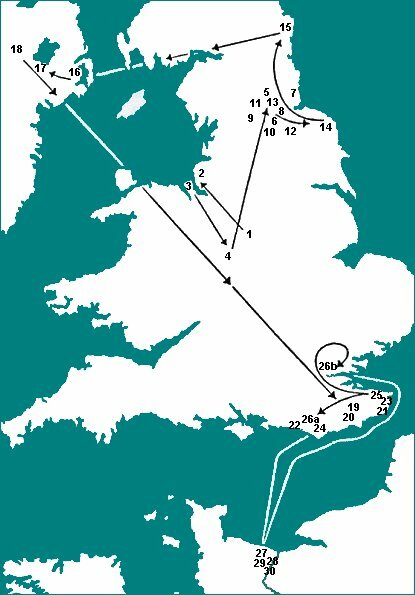 17-25 June : Embarkation for Normandy delayed by Channel storms. 1 July : Division completes assembly in the Bayeux-Creully area. 18 August : Due to a severe shortage of British replacement troops in Normandy, the 59th (as the junior division in 2nd Army) was ordered to disband in order to fill the shortage. 59 Division always prided itself in the fact that it was the only duplicate division to fight overseas.